There's a lot of potential profit to be made in South Korea, but the first step is finding the right people to talk to. Skip the data-gathering and get right to making more sales with this South Korea email database. When it is time to expand your business in South Korea, you need to buy this comprehensive South Korea mailing list. We have the updated contact information that can help you get your message across to potential South Korean customers all in this one consolidated, affordable email marketing list. Let us help you get a leg up on the Korean Peninsula! 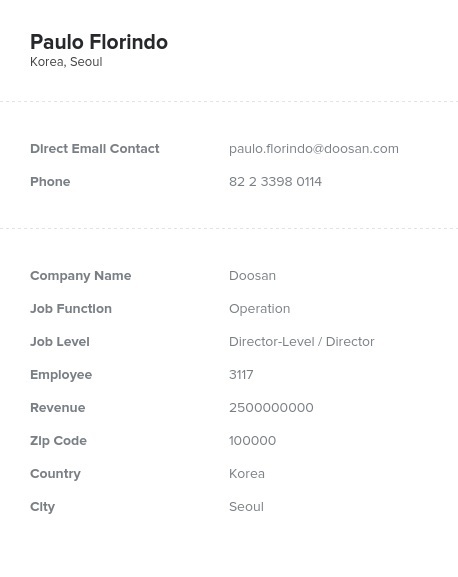 This list contains the real names and email addresses of people you should be talking to, and it also gives you their company information, job titles, phone numbers, and mailing addresses, so no matter what type of marketing campaign you're considering, this South Korea email list can help. Make a personal connection with purchasing managers and other important sales leads and you'll be well on your way to making more sales. Each business contact list we sell is human-verified, not just computer-checked. That means that you can be sure that this South Korea email database contains accurate, usable information. We even back our B2B email lists with a deliverability guarantee: If more than five percent of your marketing messages bounce back, we'll make up the difference. We also make our bulk email lists easy to use. Just buy this business database, download the .CSV file (which you can import into any CRM software easily), and you'll have the tools you need to get ahead. Try it today!